Owning a dollhouse is almost every little girl’s dream toy that they will want at some point in their lives. To be able to play house in this fashion is high on the list of favorable games. But dollhouses can be tricky. They can be too big or too small or too flimsy. It can be a bit overwhelming when searching for the right one, especially if the child wants a dollhouse for larger, American Girl and Barbie-sized dolls. Many of the older dollhouses were built to accommodate smaller, miniature dolls. However, lately there has been an influx of dollhouses that can accommodate 18-inch dolls since many children want to use their Barbie-like dolls, and even bigger ones, in their house. This isn’t possible with the more traditional dollhouses. Here we have reviewed some of the top dollhouse options for dolls up to 18 inches in size to help you choose the right dollhouse for your little one. This adorable dollhouse is great for 18-inch dolls, but what’s even greater is that children can get inside of it as well. The door and windows open and close, allowing easy access to the interior for both doll and child. This dollhouse is made of cardboard with a fun outline all over it that can be painted or colored in for an individual look. It could be used for storage as well for doll clothes or furniture, but most likely it will become a favorite play spot for doll and child. For the most part, this dollhouse does have pretty positive reviews. Though some reviewers have claimed that it is pretty flimsy and hard to assemble. However, it is made of cardboard and is fairly inexpensive for an adorable playhouse that your child and larger doll can fit in. It may not last forever, but then at that price, that shouldn’t be too big of a surprise. is the king of large dollhouses, but the Elegant 18” Doll Manor is their first one with these proportions. Children can now use their 18” dolls to play with this huge dollhouse that measures over four feet wide and five feet tall. This beautiful house follows suit with KidKraft’s attention to details and quality. It comes with 12 large pieces of furniture and will delight your child for hours. The biggest complaint about this 18 dollhouse seems to be that it is difficult to assemble. If you are good with these sorts of projects and can look past the heavy price tag, I would suggest purchasing this if your child really wants a house for this size of doll. It is one of the few on the market for 18” dolls that are set up like a typical dollhouse. It’s colorful and has everything your child needs to start playing right away. KidKraft also have replacement furniture should you need it. 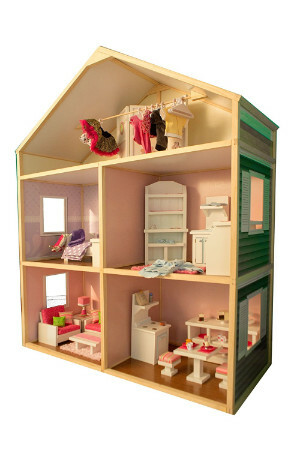 Dollhouse is a high-quality wooden house for 18” dolls and their furniture, clothing and accessories. My Girl’s house measures 6 feet tall, 5 feet wide, making it a huge house that your children can play with for many years. 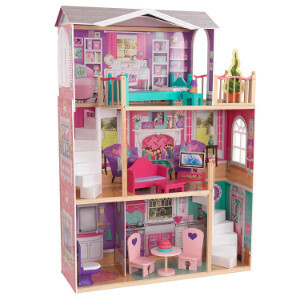 The big dollhouse is made with a high-quality 100% pine wood frame for durability and beauty. This 18″ dollhouse also includes five spacious rooms, including a 3rd-floor attic. It does not include any furniture. This is another huge house, so of course the price tag is pretty hefty too. But there are also very few negatives, so it may be a good investment. It may take a while to assemble, so patience is required. The other issue is that it doesn’t come with any furniture or accessories, so buying those items would add to the cost. However, sometimes it’s nice to be able to pick out your own pieces so it really feels like you’re decorating the dollhouse in your style. 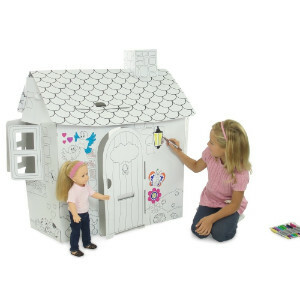 This My Girl’s Dollhouse is definitely a good investment considering its size, how many years your child will be able to play with it, and its durability. This is not a traditional doll house although it allows children to enjoy the same type of play. It has just one room, but this has reversible walls to allow a child to decide whether they want to act out a scenario in a bedroom or a kitchen. The dimensions of this dollhouse are 22 5/8 x 22 5/8 x 22 5/8 inches and it weighs 15.9 pounds. If your child just wants a basic dollhouse to play with their dolls, then this is a good option. It takes up far less room than a complete doll house while offering the same type of play, just with fewer play options. The room is made of cardboard walls and plastic corners while the furniture is wood. Children can use their own dolls and furniture with this room in addition to the furniture supplied. 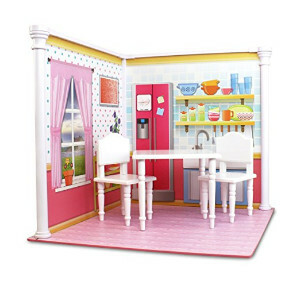 Anyone who is looking for a cheap dollhouse should consider either the Bedroom and Kitchen Interchangeable 18 inch Dollhouse Playscape or the Fits American Girl Doll House 18 Inch Dollhouse Ready to Paint and Decorate. However, it is important to remember that, in some cases, you get what you pay for. They are probably the least sturdy of the dollhouses reviewed and have generated some negative comments from customers. The KidKraft dollhouses reviewed here are great options as they both come with the furniture needed to furnish the house. Although they are a little more expensive, they are a well-known and trusted manufacturer of dollhouses and other toys. Both these houses boast attractive designs with pretty décor throughout. If your preference is to buy one that will last your child from being a toddler to becoming a teen, then the My Girl’s Dollhouse for 18 Inch Dolls-Country French Style is the better option. The attractive yet sturdy design of this wooden dollhouse gives it the potential to last for years and provide a child with a fantastic source of play and entertainment throughout their childhood. Click here for information and reviews on other awesome doll houses!